Living at Nocatee means access to first-class amenities, including the community Fitness Club where personal fitness and group exercise come together in Nocatee’s private, 5,000 square-foot facility. Conveniently located in the heart of Nocatee’s Recreation epicenter, the Fitness Club stands between the Resident Services Office and Splash Water Park, another featured amenity at Nocatee. Residents have full access to the Fitness Club facilities and equipment from 5:30 a.m. to 10 p.m. every day of the week. During peak hours, friendly Nocatee staff members are available to assist and answer fitness equipment questions. Certified Group Exercise Instructors lead a variety of weekday/weekend classes in our large Group Exercise Room. Instructors lead fitness classes that include Boot Camp, Vinyasa Yoga, Strengthen and Stretch, Pilates Express, Circuit Training, Strength, and Gentle Yoga. Depending on season and demand, monthly class schedules vary slightly. During most summer and spring months, AquaFit takes place in one of the Splash Water Park pools. From low impact Gentle Yoga to high impact Boot Camp, there is a wide variety of classes that can be modified to accommodate a variety of fitness levels. And unlike the atmosphere at many large franchised work-out facilities, the Nocatee Fitness Club offers group exercise routines designed for small class sizes that better enable individualized instruction and attention from instructors. Residents can purchase Fitness Cards that provide for up to 12 group exercise classes, with no expiration date, for only $40. Individualized personal training sessions with our Group Exercise Instructors are also available. For more information, email fitness@nocatee.com or call (904) 924-6850. Whether you are an experienced fitness buff, or someone who wants to begin a fitness program for the first time, we encourage all residents to stop by for a guided tour of the facilities. 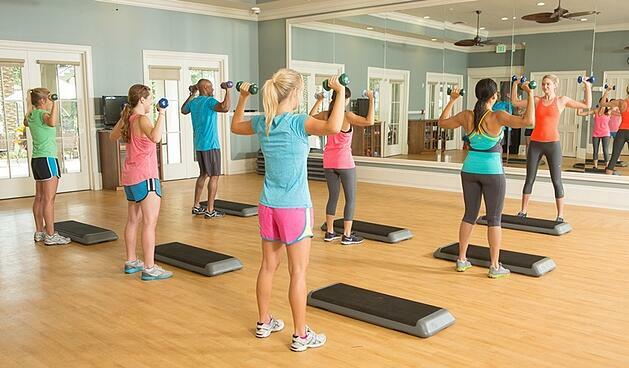 A Group Exercise Class in Nocatee's Fitness Club. To learn more about new homes available in Nocatee, explore www.nocatee.com, call (904)-924-6863 or stop by the Nocatee Welcome Center.